Buzz Blog: Can iPads Make a Difference in Physics Education? Technology fads have pervaded our culture in recent years, even if they are short-lived. Some technologies — such as smartphones, Facebook and Netflix — have endured. Other fads, however, have fallen into obscurity. Don't just take my word for it; go check how many MySpace friends you have left. Classrooms have tried to keep pace with our increasingly wired lifestyles, adopting what seems like the best technology to engage students. I remember when my high school statistics teacher complemented his lectures with an enormous touch screen TV to combat senioritis and waning interest in students. The touch screen presentations lasted no more than a week. But some tools may prove their staying power in the classroom. Earlier this year, two physics education researchers equipped high school physics classrooms with iPads, and they recently revealed their promising results online. Simply providing students with shiny iPads isn't enough, though; the key to engaging students is how you implement the technology. Valerie Otero and Ben Van Dusen (who's profiled on Physics Central) from the University of Colorado Boulder headed the research in 5 high school classrooms. Several primary themes emerged from the research, indicating that the students gained more personal meaning from physics after using iPads in their class. One fascinating shift that the researchers noticed was from the students' reliance on teachers as an authority to reliance on evidence from their experiments. For instance, one experiment required the students to cut a PVC pipe to produce a certain frequency of sound. Before they had iPads, the students had to rely on the teacher to determine pitch by ear. Several iPad applications allowed the students directly engage with evidence instead of relying on an authority figure. By numerically determining the frequency of the sound waves, the students conducted their science experiments independently. After solving problems this way, the students felt that they had a say in how to approach the problems instead of relying on the teacher's approved method, as the graph below indicates. 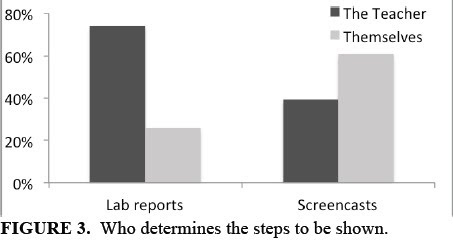 When asked who determined the steps to take for solving a problem, students felt they had more control when using the iPad as opposed to traditional lab reports. Image Courtesy of Valerie Otero and Ben Van Dusen via their arXiv paper. Overall, the students were quite happy to play with iPads during their physics classes. 60 percent of the students said that the using iPads in class was "much more enjoyable" than traditional learning, and 20 percent said it was "a little more enjoyable." Their enthusiasm eventually spread outside of the classroom. One prospective student to the high school initially thought that the school was too "ghetto," but he changed his mind when he found out the school had the "physics classes with the iPads." In this setting, iPads seemed to engender greater engagement in physics among the students. This research didn't provide conclusive evidence that the students better understood the physics though (although that didn't seem to be the purpose of this research project). Early indications suggest that iPads may have a lasting impact on students' appreciation for physics, according to the researchers. As they continue to monitor the students' use of iPads, the researchers hope to see how it can bridge the gap between a students' personal experiences and the physical world around them. You can read the full research paper online. Top iPad image courtesy of Mono via Wikimedia Commons. This contain have many profitable information. To make a difference in physics education, external education furthermore career applications accompanying information that is as correct as possible. My Best coupons for essay writing services at EssaysCoupon.com business is some beginner whilst your fame is many creativity in my thought. Please post more info to participate along us. This is encouraging. I'm developing a 3D physics simulation app for the iPad with the specific aim of giving every physics student the chance to do their own individual "experiments" in a virtual world that mimics the real world to the extent that genuine discovery through play is possible, guided by built-in curriculum focused textbooks.